Just a bit of news for gamers as excited about Grand Theft Auto 4 that’s going to be released on April 29, 2008. As a special purchase for those that pre-order GTA4 Special Edition at Amazon, you will get an Amazon exclusive GTA4 license plate for those times when you are on the run! 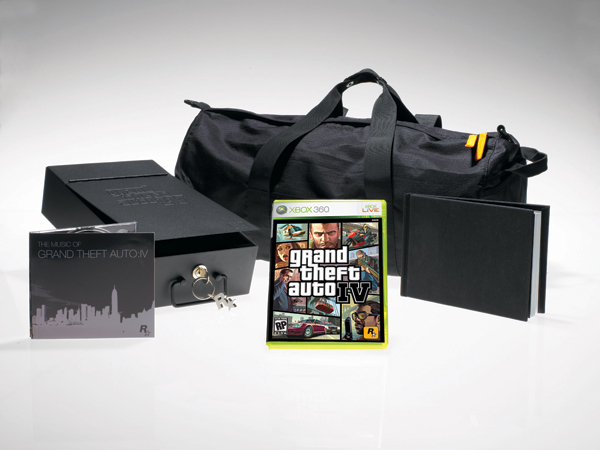 Along with the game, you will also receive a GTA4 art book, soundtrack audio CD, Rockstar key chain for the safety deposit box keys, and a Rockstar duffel bag. Oh, and if that wasn’t enough, you will get a unique code that will allow you to download 4 Xbox Live Grand Theft Auto gamer pics. You want more? You mean, all of that still wasn’t enough? Ok. When you pre-order your copy of GTA4 Special Edition, your email address will be automatically entered in the XBOX Live GTA4 Sweepstakes! I don’t think they can give away anything else free for this game! Click your system below to pre-order your copy of Grand Theft Auto 4 today!